PC Monster Hunter World will be getting 2 more quests after the Winter Star Festival. Players will have access to Arch Tempered Vaal Hazak and the USJ quests. The Universal Studios Japan™ Collaboration Event Quests will be live starting December 13th, 7 PM EST until January 3rd, 6:59 PM EST. Players can forge the Azure Star Blade Longsword and the Felyne Azure Star armor after completing USJ: Gold Star Treatment. Starting December 20th 7 PM EST until January 10th 6:59 PM EST “USJ Blazing Azure Stars!” event quest will be live. Players can forge the Azure Star “Dragon Dance”, the upgraded Longsword version of the Azure Star Blade and the Azure Starlord Armor. See our USJ Guide for detailed information about these events. Arched Tempered Vaal Hazak will be live from December 13th 7 PM EST to December 27th 6:59 PM EST. 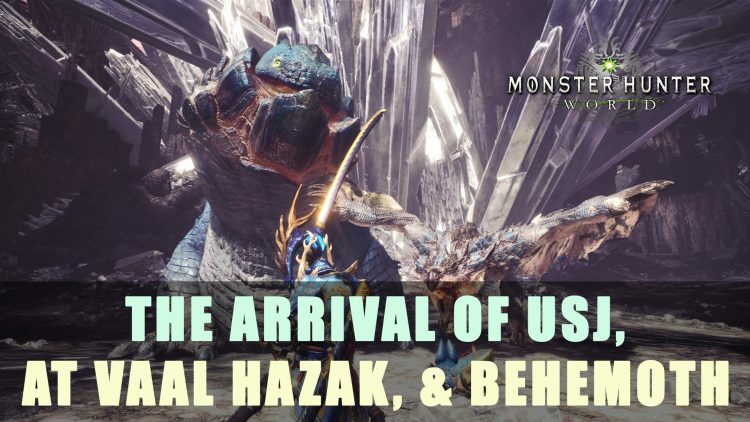 See our Vaal Hazak Guide for complete information about the rewards. Talk to the Serious Handler in Astera after completing the game (HR 16 or higher) to take on a special assignment near the bounty board. For everything Behemoth related see our Behemoth Guide. There’s a bug that prevents you from selling items on the rewards screen after completing the Kulve Taroth Siege quest, if the item box contains the maximum number of that item (9999). This bug prevents you from individually selecting and selling the item and jumps from the item icon to the Sell All option with the cursor. This only occurs when you possess the maximum number of an item. Before going out on the Kulve Taroth Siege quest, please make sure you do not possess (close to) the maximum number of any of the reward items. For all your Monster Hunter needs stop by our Monster Hunter Wiki. For all your Monster Hunter guide needs step by the blog. Don’t miss out on the Winter Star Festival now live for all platforms!